If you read the documentation about the regex features in various applications, you'd think they all interpret regular expressions "just like Perl" does. But that is nonsense. Even different versions of Perl interpret certain regular expressions differently as Perl's developers fix bugs and add new features. Other regex libraries and programming languages evolve too. While most modern regex flavors have copied Perl's syntax, there are many subtle differences in behavior. Fortunately, RegexBuddy is aware of all these subtle differences in nearly all of the popular regular expression flavors. When creating or analyzing a regular expression, RegexBuddy explains exactly how your chosen application interprets each part of the regex. When testing your regex, RegexBuddy emulates the application's behavior, so you'll see exactly the same regex matches. There are situations in which a regex needs to work with multiple regex flavors. A common situation is a regex used in a shared code library that needs to work with multiple versions of the same programming language. Use RegexBuddy's ability to compare your regex between multiple regex flavors to make sure it works as intended with all of them. 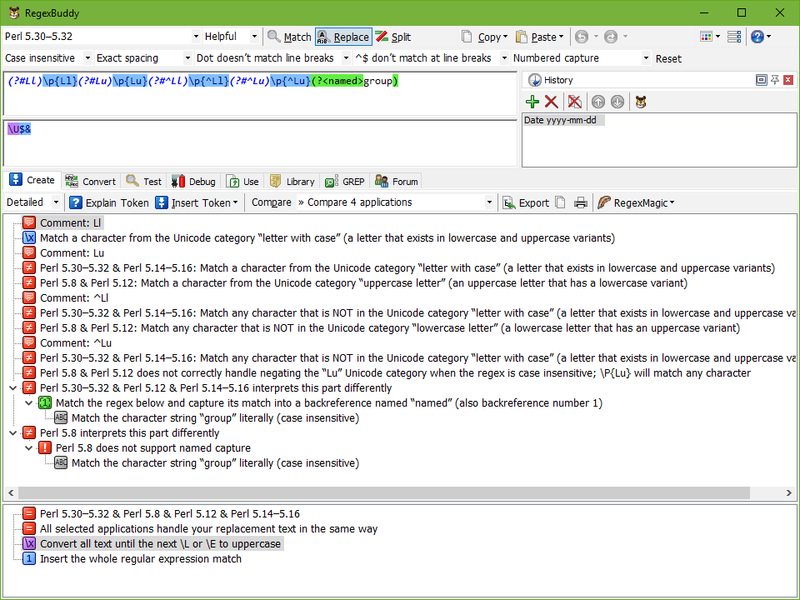 The screen shot shows the comparison of a regular expression and replacement string between five different versions of Perl. It shows that unlike later versions, Perl 5.8 does not support named capture. It also shows that Perl 5.12 and prior had issues with applying the case insensitive flag to Unicode categories. Comparing your regex in RegexBuddy enables you to fix your regex immediately while you're still creating it. Without RegexBuddy, you would likely remain unaware of such issues until you were testing your software and you would spend much more time to discover that the problem was caused by changes in Perl's regex engine. You can learn a new regex flavor easily by comparing your regexes between the flavor you know and the flavor you're learning. You can compare between any number of all the applications that RegexBuddy can emulate, including custom applications.